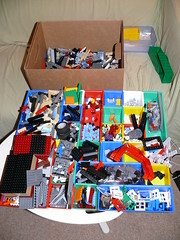 I started sorting my lego bricks today as well. It has been years, but I just picked up some large disposable tuppaware, and did a color sort. how does one get information about the lego clubs in the bay area? Sorting by color? I did that for a while but found it hard to locate a particular piece among a monochromatic pile. I sort (mostly) by shape, so the color I want jumps out at me. Of course the various shades of grey are easily confused, so I try to keep those separate where I can. I’ve sorted and resorted and finally come up with a good method for me. I sort by the category tree on BrickLink, I keep parts that I have a small supply of in Planar Plastic boxes with dividers that can be arranged to make different size compartments. Larger quantities go in cheap food storage containers, XL quantities in totes. By using three standard containers – planar cases of the same size, food storage of the same size, totes of the sames size – everything can be neatly stacked or expanded as LEGOs come and go. Todd, that’s a lot like how I do it, except that I tend to use larger bins and a lot of ziploc baggies. Most of my LEGO parts are currently stored in the blue tubs from the 3033 set, but I’ve recently been converting them to clear bins from IKEA instead. 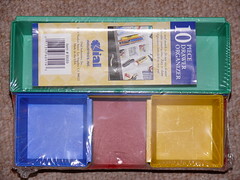 In each bin would go a number of ziploc bags for related parts. My categories aren’t strictly in line with the BrickLink/LDraw category tree, but it’s fairly close. I have a few categories that aren’t found there, such as lumping all bricks that have curved tops together, or all vehicle parts (wheel holders, fenders, etc.) together. I also keep all transparent parts separate from opaque ones. Additionally, most parts are sorted into categories of colors: main colors (red/blue/white/black/yellow), earth tones (new greys/green/tan), obsolete colors (old greys/brown), and rare colors (everything else).